New York-based artists César Brodermann and Sebastian Abarbanell combine elements of dance, film, photography, music, and costume in their collaborative work. Both have previously worked and performed with Gallim Dance/Andrea Miller and Sebastian is currently a member of Sidra Bell Dance New York. Alice Gosti is an award-winning Italian-American choreographer, hybrid performance artist, curator, DJ and architect of experiences, working between Seattle and Europe since 2008. Dance Magazine has described Gosti’s work as “unruly yet rigorous, feminine yet rebellious, task-like yet mischievous." N E 1 4 Dance is a collective, founded by NYC native Michael Greenberg, that explores choreography to the most collaborative extent. Intended to be an explorative workshop, each choreographic work is deeply rooted in the transference of ideas and thoughts passed from member to member. Familiar vocabulary is juxtaposed by outlandish and seemingly out of the ordinary scenery. The created worlds challenge the perception of "normalcy" invite audiences to investigate the relationship between movement and fantasy. Quilan ‘Cue’ Arnold is a Brooklyn-based dance professional with a BA from Penn State University and an MFA from Ohio State University. His work has been showcased internationally with his most recent work presented at Laguardia Performing Arts Center in Queens. Quilan has performed with the New York Philharmonic, Philadanco, and Rennie Harris's hip-hop companies. Pedagogically, he has served at Towson University (2016-2017), and teaches at Gibney Dance Center, Mark Morris Dance Center. House of Ninja is a collective of movement artists known for their stellar contributions to the style of Vogue. The house was created in the 1980s by William “Willi Ninja” Leake as a “safe-house” for members of the LGBT+ community. Through the House of Ninja, vogue moved from the underground dance scene to appearances in mainstream media. House of Ninja has had a fruitful history in the ballroom community as well as the entertainment and fashion industries. The House of Ninja is - through dance, music and fashion - designed to educate about ballroom, the LGBT+ community and HIV. We are celebrating the life of our late pioneer Mother Willi Ninja, by always showing up and working it out! Renegade Performance Group is a Brooklyn-based dance company founded in 2007 exploring Black artistic aesthetics and expressions through dance theatre, visual performance, and film/media. RPG collaborates with artists of all genres on projects that stretch performance presentation. Our work is designed to engage new audiences to performance, media, and culture. The company was formed as an artistic outlet to foster dialogue compelled by the human experience. Since the company's inception, RPG has performed throughout NYC, domestically, and internationally. Donofrio Dance Company, a contemporary dance company established in 2009 by choreographer Taylor Donofrio, seeks to build work that challenges viewers to examine today’s shifting experience of the present and our understanding of the human experience. DDC’s work builds upon a heightened awareness for how audiences have evolved according to technology’s ability to deliver an immediate, transient experience. Sarah Chien is a dancer and world traveler who creates improvised works with collaborators from dance, music, circus and theatre. Her work has been shown at BKSD, Center for Performance Research, Triskelion, The Brick, and Chez Bushwick. She has been a company member of Andre Zachery/Renegade Performance Group, Sydnie L. Mosley Dances, and Jody Sperling/Time Lapse Dance. Influential training experiences include living in Ecuador, studying at Barnard College, working with Elia Mrak, and practicing qigong with Daria Fain. Kate Harpootlian is a dancer and choreographer who resides in Los Angeles, New York and kind of in her suitcase. Her work credits include Carrie Underwood’s “Something in the Water,” Dancing with the Stars, Merce Cunningham’s Inlets II, Boardwalk Empire, Ellen and SYTYCD Season 12. In 2016, she was runner-up at the Capezio Ace Awards and the following year she premiered "Better Late Than Never" at 25Live in Long Beach. A Lady in the House Co.
A Lady in the House Co. is a dance company created by choreographer, artistic director, performer and producer Nubian Néné. Inspired by strong women, she is interested in creatively responding to the real experiences of racism, discrimination, and economic social standing, through street styles of movement, like house, hip-hop, breaking and waacking. Nubian Néné creates her unique works through a collaborative process with performers and artists, using mediums like films, photography and visual art to enhance each work. Based in New York City, Douglas Dunn has been working solo and with his Company, Douglas Dunn + Dancers, in the USA, Europe, Asia, and Latin America, since 1971. He collaborates with artists, musicians, poets and playwrights to present a multifaceted theatrical experience. Commissions include the Paris Opera Ballet and the Institute of Contemporary Art, Boston. Awards include a Bessie for Sustained Achievement, and Chevalier des artes et des lettres from the French Ministry of Culture. He has completed film projects with Charles Atlas and Rudy Burckhardt. Dancer Out of Sight, a book of his collected writings, is available at Amazon.com. AnA Collaborations, co-founded by dance-based artists Audrey Rachelle and Alex Jenkins, is a production collective dedicated to creating accessible, visceral, and moving experiences for people of all backgrounds. Since 2015 the company has generated a variety of works through collaborations with artists from numerous fields, inspiring conversation across art disciplines and connecting to diverse audiences. Sophie Maguire, choreographer and landscape architect, and Emma Wiseman, puppeteer and visual artist, use their unique worldviews to create an evolving recalibration of everyday objects, situations, and spaces. Always curious about how the fantastical nature of theater can influence one’s reflection on reality, Sophie and Emma are committed to creating performance that engages with natural, real-world surroundings while evoking larger ideas and concepts. The pair aim to bring work outside typical theater environments and engage with the historical layers of spaces in the hope of elevating the moment-to-moment experiences of their audience, even after the show. Javier Padilla & The Movement Playground is an emerging movement collective interested in exploring the energy within stories and spaces. Founded in 2014, The Movement Playground has presented work at various venues such as Dixon Place, Triskelion Arts, The John F Kennedy for the Performing Arts, Salvatore Capezio Theater at Peridance, Judson Memorial Church and the Inside/Out Stage at Jacob's Pillow. Khalifa Babacar Top is a Senegalese artist who began dancing at a young age with Sabar in traditional ceremonies. 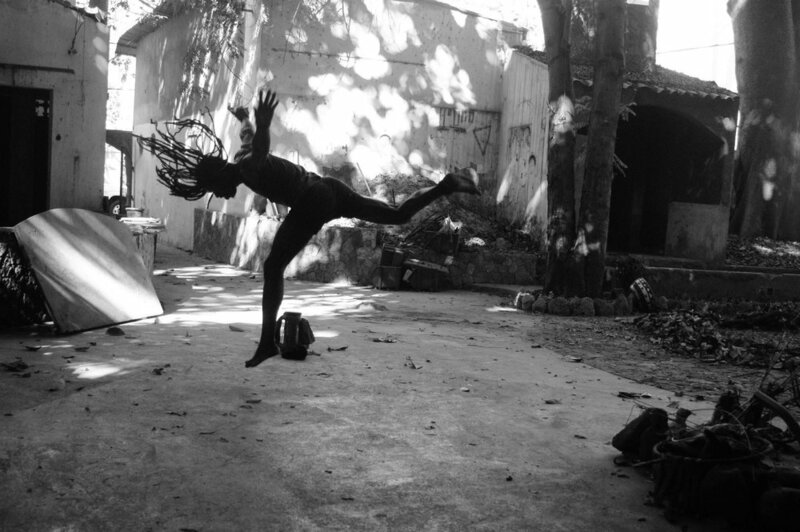 His interest in storytelling through the body lead him to seek out African contemporary dance forms. His work is about connecting to the history of the land, and gravitates to non-traditional spaces. He has taught and performed throughout the continent of Africa, Europe and the United States. The Ladies of Hip-Hop Festival is an organization that provides girls and women with space to express, learn and share their voice through Hip-Hop arts. LOHHF offers workshops, performance opportunities, international artist exchanges and public talks to train, educate, and create the next generation of women in the Hip Hop culture. Teaching and sharing the culture through the female perspective is essential to the growth of Hip-Hop culture. Fleuve | Espase danse is a contemporary dance company based in Saint-Jean-Port-Joli, in Quebec, Canada, where the shows are created and performed on the shores of the St. Lawrence River. The site-specific work of the choreographer Chantal Caron made Fleuve stand out from the company's inception. Expanding rapidly, the company is now creating its own niche in the province's dance ecology.